This exhibition is a visual representation of cultural exchange. In this exhibit, I try to present my works to purposefully encourage conversation about my culture and to share my stories of the land I was born in. "Shortcut to the Silk Road" brings to life the most celebrated trade route in history. Extending 4,000 miles, the Silk Road derives its name from the lucrative trade in Chinese silk carried out along its length. This ancient road was a historical route which stretched from the far reaches of China through the cities and empires of Central Asia and the Middle East and quickly became a cultural bridge linking cultures, religions, languages and traditions between the countries it traveled. Since this road passed through ancient Persia, this exhibit is taking the viewers on a journey to showcase the cultural exchange and influences from Iran. In some pieces Saffron and Tea were used as these were some of the most famous trades from ancient Persia. 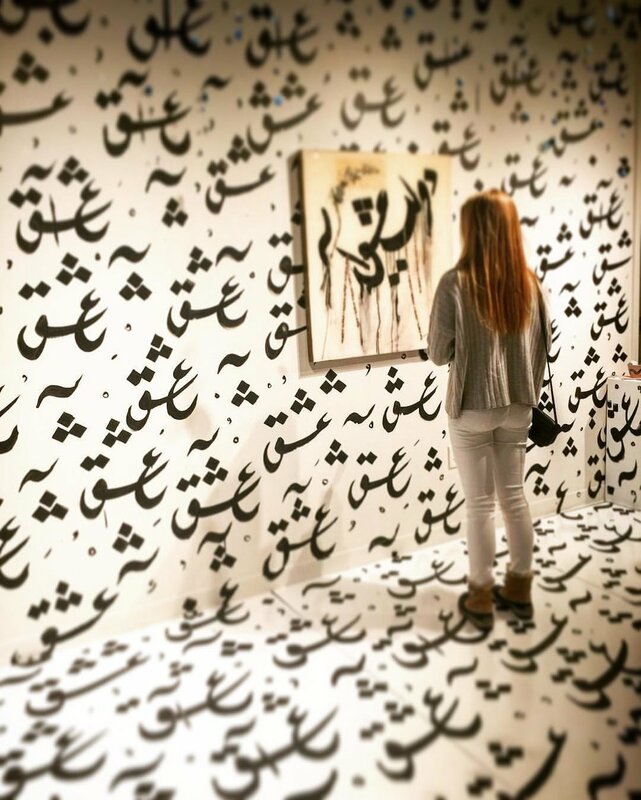 The word "LOVE" in Farsi was written over and over on the walls to change the negative memory of all the political statements on walls of Tehran into something positive. The space invites all viewers to stay as long as they wish. Some mediated, some wrote over a designated wall what they thought of the exhibit. Blue Beads are believed to take the Evil Eye away. Another aspect to make this space more spiritual and positive.